We are researching Scotland’s radical press and the history of the pre-internet alternative media. We are looking at: Cencrastus, Common Sense, Scottish Child, Calgacus, Radical Scotland, Cran Tara, Edinburgh Review, Cut, Harpies & Quines, Counter Information, Scottish Anarchist, Here and Now, the Angry Corrie, STUR, Scottish Marxism, Scottish Left Review, Glasgow Keelie, Cienfuegos Press, Liberation, Daily Worker, Paper Tiger, Scottish Vanguard, Aberdeen Peoples Press, Chapman, One o Clock Gun, the Skelf, the Word. Thanks to everyone for your suggestions. Suggestions for other publications to consider are very welcome. If you were involved in any of these and would be up for an interview get in touch? See also British Underground Press. mustn’t forget the Cienfuegos Press from the 1970s. mostly international and anarchist, published from Orkney. am delighted to see “Common Sense” on your list. I was a founder of “Common Sense” and was on its editorial board for most of its existence. I still consider the ideas that “Common Sense” stood for as important, and would be very happy to offer my help. If you like, please contact me by email at richardmgunn@googlemail.com. Of course – I kind of put you guys in a later bracket but yeah. We have contact with Richard thanks. I think you will find that the ‘Scottish Trades Union Review’, first published about 1976, which lasted over twenty years, was the longest-running left journal in Scotland. I’m sure the Library at Glasgow Caledonian University, which has a large left and trades union archive, including the libraries of the STUC, the Communist Party in Scotland, and Norman Buchan MP, has a complete collection. So why has the STUR not been added to the list of left print journals you are considering? Dougie Harrison, STUC Assistant Secretary and active Communist Party member, 1976-1990. What about Liberation magazine, published in the early to mid-1990s. Editorial group was made up of a group of left-wing nationalists both within and outwith the SNP. Almost all of us are still active in the Yes movement in many different organisations. what about studying the Scottish content of the Daily Worker in the 1960s when Phil Stein, a trade union activist, was the Scottish staff man. it was certainly the alt press of its day. Happy to talk to you about short-lived Calgacus. Tom Nairn and John Herdman might chip in as well. There is also the even shorter-lived Bulletin of Scottish Politics that Tom launched. United Scotsman, Scottish Vanguard; Catalyst; Scottish Marxist; a couple from the SNP stable I’ll need to dig out. Counter-Attack, Paper Tiger, Inklins from my RSSF Aberdeen student days. I’ve touched on this in a couple of essays I’ve written, the latest being one on Hamish and Gramsci in Paddy’s last collection- Anent Hamish Henderson. Was involved in Edinburgh Review from 1984 to about 1996 … was editor from 90-94 or so. Key person to interview is Peter Kravitz, who re-cast New Edinburgh Review as ‘Edinburgh Review’. After me (Robert) Alan Jamieson and Gavin Wallace took over. Alan should be interviewed. Also Jim Kelman who was closely linked to ER via Peter. Malcolm Dickson who edited Variant should also be interviewed. Also on the art magazine side Hilary Robinson and Peter Hill (Peter set up Alba, Hilary took it over). I had some involvement with Aberdeen Peoples Press around 1974/75. I can recall at that time seeing an obituary notice for the poet Sydney Goodsir Smith in a newspaper in a pub off Rosemount Viaduct while drinking with friends. Later on I would become better acqainted with his poetry. APP was put together in the basement of a big hoose in Rubislaw Den ‘owned by a rich anarchist’ as somebody telt me at the time. A very atmospheric place. I wrote some articles on cultural topics and drew cartoons (one was of an American Southern judge beating a black guy with his gavel) and I think I still have some odd issues at home. Ah belle nostalgie de la boue … Alan Marshall, an Aberdonian who was one of rhe leading lights of APP on the technical printing side, turned up for me again years later in Grenoble, where I was teaching at the uni in 1993. He was a pal of my faculty colleague there and fellow Scot Keith Dixon, who edited Etudes écossaises from Grenoble for many years. I met up with Alan again some years later in Lyon, where he was – aptly – working in the museum of printing in the city. Etudes écossaises is, as they say, another story – an academic journal, sure, but it too belongs to the narratives of radical Scottish publishing – in an expat context. What we’ve all tried to do anent Scotland when we’ve been working abroad is also part of the narrative. John ‘Moses’ Cunningham and Ken Clarke. Your info on Etudes ecossaises is fascinating. I had no idea. Its roots and links to back home always intrigued me. I used to have the odd issue. My other impression was that the groups with the strongest organic roots in the city were the local CPGB (‘the ‘Party’ – as in ‘There’s only one Party in Scotland, laddie”) – and the LP left. It was all very sectarian at times, a lot of the time. but you could get away from all that by moving sideways into the overlapping circle of the folk scene – a refreshingly different sort of ‘lefties’ and a significant nationalist orientation of its unaligned left. Chapman and The Angry Corrie have to be in there; as does The One O Clock Gun. Chapman is pre Internet, as something akin to an online edition has never worked for them / they never wanted that. Same applies to Gun. In The Angry Corrie important conflicts between the inhabitants. of Scotland were played out. Cloaked in anoraky humor. Please let us know about your final selection. Thanks, will do. Chapman and the One o Clock Gun are like “Doh”, but i don’t know the Angry Corrie, sorry. Angry Corrie was great. Wish I had held on to more copies. t know if there were more – Swanney Bean featured! I was a contributor to many of the magazines on your list; have a look also at SCOTS GLASNOST, dedicated to writing in Scots, and which I co-started with makar John Brewster around ?1989. Wullie Hershaw was also involved and it was edited latterly – up to the mid/late 90s by the late Neil R. MacCallum. The Scottish Poetry Library should have a run, also I would hope the NLS. Scots Glasnost also published special editions of Scots translations of Rimbaud and of the Scots-born German poet John Henry Mackay (the latter tr. by the late Willie Neill. Happy to elaborate on any of that. Rob Edwards and I were first editors of the bi-monthly SCRAM (Scottish Campaign to Resist the Atomic Menace) which ran from 1977 for 5 or 6 years. Originally part of the anti-Torness campaign it continued for a while as a safe Energy magazine after Torness was completed. But I wonder whether it would also be worth including, in passing, another aspect of this – the sale and distribution of these magazines, and the role of FAB – the federation of Alternative Bookshops. A group of us set up First of May in Edinburgh in 1977, and it very quickly became part of a UK network of radical bookshops, and the distributors PDC (Publications Distribution Co-op) which allowed the dissemination of radical publications. Good shout. First of May was pivotal, as Word Power later. Thanks Chris. I note that despite me alerting you to it earlier, you haven’t added Scotland’s longest recently published left print journal to your list; the ‘Scottish Trades Union Review’. Is there a reason for this omission? It seems rather strange; the STUR almost certainly had wider influence than many of the journals on your list. There’s an embarrassment of riches surely and it takes time not just to take note of it but also to digest it. Clearly STUR is a major player in this story and we should be indebted to you for rightly emphasing that. The point of this exercise is that it’s aiming to bring together the very various aspects of a hidden history; it just hasn’t been done before. So much amazing stuff happens in Scotland – and, it now appears, has happened – but it’s all been so fragmented: the ‘you in your small corner and I in mine’ syndrome that has held us back from realising the bigger picture. We won’t have serious cultural and political advance in Scotland until we challenge and overcome such fragmentation. Let’s welcome this initiative for what it’s bringing to light. i would agree with Tom’s last comments above. 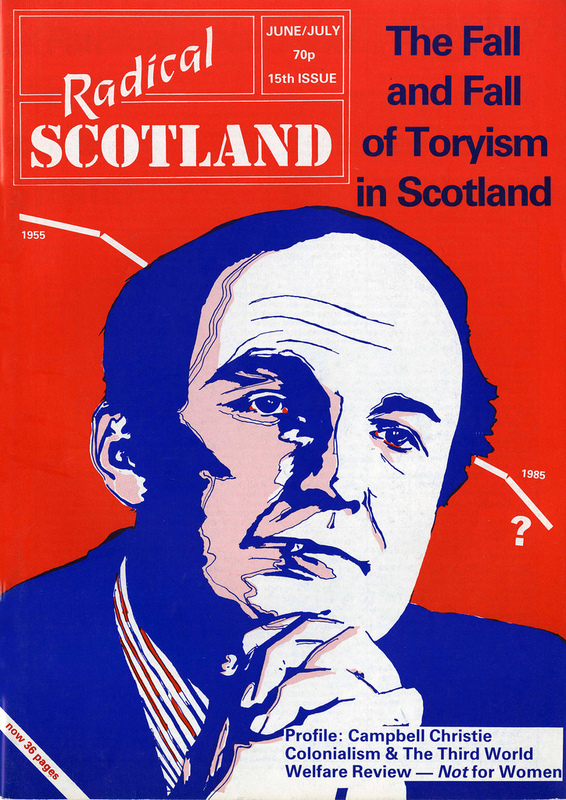 For what it’s worth, Dougie, while STUR certainly had a long run and was handsomely produced, my own view is that the CP’s ‘Scottish Marxist venture, under Willie Thompson as I recall, was actually of greater significance, not least because of when it came out and its distinct cultural orientation. Hi Dougie, happy to add it thanks. Can you send us a copy? Ray, Scottish Marxist under Willie’s editorship was certainly important. I had a wee hand in its gestation. Also not so far mentioned, and going back in history, are the anarchist publications associated with Guy Aldred in Glasgow. I managed to acquire a wheen of them when the bookshop still ran in Glasgow, behind the City Chambers, in the late 60s, but gave them to Jim Kelman a long time ago. Being who he is, ne probably still has them. I replied via facebook stream on the subject but pre internet involved in succession of magazines and broadsheets produced in Scotland. An article i penned appeared in the Edinburgh Review issue 83 , commissioned by Peter Kravitz when both involved in Free University network. A Public Nuisance was about the 1974-86 period with lots of references to publications. Glasgow Peoples Press 1977-8, Here and Now 1985-97 and Counter Information 1984-2002, collectives that engaged me the most. Hey thanks Keith – will be in touch.